Permeable reactive barriers (PRBs) are in situ treatment zones created below ground to clean up contaminated groundwater. PRBs take advantage of natural groundwater migration to transport contaminants to a defined treatment zone. Contaminants are removed from groundwater in the PRB as treated groundwater passes through the permeable zone. Eventually a “clean front” is created on the down-gradient side of the PRB. Zerovalent Iron (ZVI) was the first reactive material used in PRBs for groundwater remediation, and it continues to be the primary material used in the construction of these treatment systems. ZVI PRBs can treat groundwater contaminated with chlorinated solvents and their breakdown products such as tetrachloroethene (PCE), trichloroethene (TCE), cis-1,2-dichloroethene (cis-DCE), vinyl chloride (VC), 1,1,1-trichloroethane (1,1,1-TCA), 1,1-dichloroethane (1,1-DCA), 1,2-dichloroethane (1,2-DCA), chloroform, and carbon tetrachloride; also explosives such as TNT and RDX; as well as cations of Pb, Cd, Ni, Zn, and Hg; and anions of Cr, As, Sb, Se, U, and Tc. 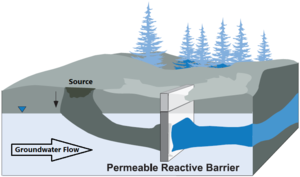 Permeable Reactive Barriers: Lessons Learned/New Directions. Interstate Technology Regulatory Council (2005). understanding groundwater flow to ensure the contaminant plume is intercepted for treatment (See Fig. 1) so contaminant flow beneath, around, or above the treatment system does not occur. PRBs are generally keyed into impermeable hydrostratigraphic units, such as clay layers or bedrock, to prevent underflow of contaminants beneath the treatment zone. The first field-scale test of a PRB constructed with ZVI was conducted in 1991 at the Canadian Forces Base, Borden, Ontario by researchers from the University of Waterloo. The first full-scale ZVI-based PRB was constructed in Sunnyvale, California in 1994 to treat groundwater contaminated with TCE and cis-DCE. Long-term performance studies have documented sustained removal of trichloroethene and hexavalent chromium by ZVI PRBs and their continued hydraulic performance for up to 15 years. ZVI degrades chlorinated ethenes, ethanes, and methanes via reductive abiotic reactions that largely circumvent the production of toxic chlorinated daughter compounds, such as vinyl chloride, which can be produced during biological reduction. For example, Arnold and Roberts reported that >85% of PCE and >90% of TCE treatment by zerovalent iron is accounted for by β-elimination reactions that avoid production of cis-DCE and VC. Zerovalent Iron has also been used in pilot or full-scale tests to treat groundwater contaminated with metals (e.g., chromium), metalloids (e.g., arsenic), and radionuclides (e.g., uranium). Contaminant removal processes are complex and involve a combination of sorption to the surface of the ZVI or secondary minerals formed in the PRB, reductive precipitation, and co-precipitation. Other possible uses of ZVI for groundwater include treatment of explosives such as nitro aromatic compounds. Treatment applications of ZVI for organic and inorganic contaminants encountered in groundwater at hazardous waste sites are summarized in Table 1. Dissolved O2 concentrations ≲2 mg/L: Excess dissolved oxygen leads to rapid iron corrosion and formation of low density iron oxide precipitates that may lead to hydraulic failure. Nitrate-N concentrations ≲10 mg/L: Like dissolved oxygen, nitrate enhanced iron corrosion leads to rapid iron corrosion and formation of low density iron oxide precipitates that may lead to hydraulic failure. Bicarbonate alkalinity ≲250 mg CaCO3/L: Carbonate minerals (aragonite, siderite, chukanovite, carbonate-green rust) precipitate in the moderately alkaline pH environment (pH~10) produced by ZVI PRBs and most of the porosity and reactivity reduction in PRBs can be accounted for by these minerals (see Figure 2). Sulfate concentrations ≳100 mg/L: High dissolved hydrogen generated by iron corrosion creates a favorable environment for sulfate-reducing bacteria and methane-producing archaea. Metal sulfide precipitates like mackinawite (FeS) provide a source of secondary reactivity for chlorinated solvents and metals. Thus, levels of sulfate in influent groundwater promote natural sulfidation of ZVI PRBs and potentially enhanced treatment capacity. Total dissolved solids below ≲1500 mg/L: The amount of secondary mineralization and clogging potential increases with increasing solute levels. Figure 2. 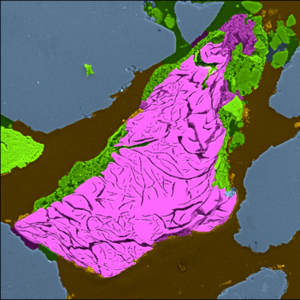 False-color scanning electron micrograph of a zero-valent iron grain (pink) coated with secondary precipitates (iron oxide and aragonite; green) surrounded by native aquifer quartz grains (blue). The iron particle is approximately 1.5 mm in length. Performance monitoring of PRBs typically includes: 1) sampling groundwater monitoring wells located up-gradient of the PRB to establish influent contaminant concentrations and groundwater geochemistry; 2) sampling groundwater monitoring wells located within the PRB to establish in-wall behavior; and, 3) sampling groundwater monitoring wells located down-gradient of the PRB to establish contaminant concentrations and groundwater geochemistry in the effluent. Key monitoring parameters include: contaminant(s) and daughter product(s), pH, oxidation-reduction potential, specific conductance, alkalinity, calcium, iron, and sulfate. These monitoring parameters provide an indication of whether or not the expected geochemical environment is present within the treatment zone, and also that contaminant degradation is occurring. For chlorinated solvents, analysis of the parent compounds and daughter products (e.g., ethene and ethane) aids in the performance analysis. Compound Specific Isotope Analysis (CSIA) can be helpful to understand contaminant degradation processes in complicated systems. Hydrologic monitoring typically consists of gradient analysis to determine flow directions and whether water level changes are abrupt in the vicinity of the PRB, indicating the potential for impeded groundwater flow. Core collection with solid-phase analysis and/or geophysical surveys (e.g., conductivity probing) are not common or routine components of performance monitoring, but can be considered in situations where anomalous behavior is encountered such as a failure to meet performance criteria. incomplete coverage of the reactive medium in the subsurface. Many of these issues can be addressed with rigorous site characterization, which may incur extra cost and time prior to remediation, but can potentially avoid implementation of secondary measures. ZVI is perhaps the most widely studied and best understood reactive material used for groundwater remediation. It will continue to serve as a benchmark for other novel treatment media and for studying treatment options for emerging contaminants. The environmental industry is becoming accustomed to screening sites for potential ZVI applications and is actively taking advantage of improving ZVI performance, i.e., through natural sulfidation and treating up-gradient sources of contamination to extend the lifetime of the PRB. Advantages of using ZVI in PRBs for remediating contaminated groundwater include: wide range of treatable contaminants (organics and inorganics); expectation of complete subsurface coverage; and, flexible adaptation to variable contaminant flux and plume geometry. Disadvantages include: construction challenges and uncertainty in predicting long-term treatment and hydraulic performance. These uncertainties can often be addressed with rigorous site characterization. This page was last edited on 28 January 2019, at 21:22.